Worthwhile Canadian Initiative: What's special about monetary coordination failures? What's special about monetary coordination failures? This is a response to Brad DeLong's and David Glasner's good posts. They are good posts because they forced me to think. This is what I think. Let there be three tradeable goods: apples; bananas; and gold. Apples and bananas are perishable, but gold lasts forever. One apple tree produces 100 apples per year, regardless. One banana tree produces 100 bananas per year, regardless. Trees cannot be produced. Gold cannot be produced. Gold is the medium of account. Apples and bananas are priced in gold. Those prices may be sticky. All agents have identical Cobb-Douglas preferences. U=Aa.Bb. (G/P)g, and have a rate of time preference r. A is the quantity of apples consumed, B is the quantity of bananas consumed, G is the quantity of gold held, and P is a price index. Each agent owns one tree. Half the agents own an apples tree, and the other half own a banana tree. In full equilibrium, with flexible prices, apples and bananas have the same price (because a=b), and each agent consumes 50 apples and 50 bananas. There are two parallel economies where all of the above is true. But one economy is a barter economy, and the second economy is a monetary exchange economy. In the barter economy there are three markets: a market where apples are traded for gold; a market where bananas are traded for gold; and a market where apples are traded for bananas. Assume that trade in the barter market must take place at the same relative price Pa/Pb as in the other two markets (each good has the same price in all markets). In the barter economy agents desire to hold a stock of gold because they wear it as jewelry. They get utility from the real stock of gold G/P they hold, because they like to flaunt their wealth. In the monetary economy agents desire to hold a stock of gold because they use it as a medium of exchange. They get utility from the real stock of gold G/P they hold, because it makes shopping easier. Gd/P = L(Y,i) where dL/dY > 0 and dL/di < 0, and where P is an index of prices of apples and bananas, Y is an index of the volume of apples and bananas traded, and i is a shadow nominal interest rate, being the sum of the (marginal) rate of time preference r plus the expected rate of inflation. I am now going to hit both economies with some shocks. 1. Increased demand for gold (g increases), holding prices fixed. In the barter economy, absolutely nothing happens to the allocation of resources. Each agent continues to consume 50 apples and 50 bananas, just like in full equilibrium. Because if one agent were consuming 51 apples and 49 bananas, and another were consuming 49 apples and 51 bananas, they would both gain from swapping one banana for one apple in the apple/banana market. There is an excess demand for gold and an excess supply of apples in the apple/gold market. There is an excess demand for gold and an excess supply of bananas in the banana/gold market. But that affects nothing. Agents want to buy gold with apples and bananas, but they can't, because they can't find a willing seller, so they don't. In the monetary economy there is a recession. Agents who own an apple tree will consume more than 50 apples and less than 50 bananas. Agents who own a banana tree will consume more than 50 bananas and less than 50 apples. Their utility will be lower than in the barter economy. There is an excess demand for gold and an excess supply of apples in the apple/gold market. There is an excess demand for gold and an excess supply of bananas in the banana/gold market. And that affects everything, because there is no other way for the apple producers and banana producers to trade apples and bananas. Sales of apples and bananas fall until the stock of gold is willingly held. Apple producers consume where the (marginal utility of bananas/marginal utility of gold)=Pb. Banana producers consume where the (marginal utility of apples/marginal utility of gold)=Pa. Some of you may say that is not a recession, because production of apples and bananas is unchanged. You are wrong. The worker who loses his 50 hour job and is involuntarily unemployed still produces those same 50 hours of labour. But now he must consume those 50 hours himself, just like the apple producer who cannot sell his 50 apples must consume them himself. 2. A switch in demand from apples to bananas (a falls and b rises, but a+b stays the same), holding prices fixed. To see that we get the same result in both barter and monetary economies, suppose we are in the monetary economy, with an excess supply of apples in the apple/gold market, and an excess demand for bananas in the banana/gold market. Now suddenly the third market opens up, so agents can swap one apple for one banana directly. The banana producers won't want to use that market, because they have already sold as many bananas as they want and bought as many apples as they want. So opening that barter market makes no difference to the result. 3. An increased demand for fruit trees relative to current consumption of apples and bananas (r falls). Price of fruit trees flexible; prices of apples and bananas fixed. In the monetary economy, there is a recession. The price of fruit trees rises to eliminate the excess demand for fuit trees. This lowers the rate of return on owning a fruit tree, and this lowers the opportunity cost of holding gold, which increases the demand for gold. It's exactly the same as an increased demand for gold caused by an increase in g (my first case above). In the barter economy, nothing happens to the allocation of resources. We have already seen that an increased demand for gold does not affect the allocation of resources in a barter economy. 4. Bottom line. My conclusions. For the second shock (a change in preferences away from apples towards bananas), we get the same reduction in the volume of trade whether we are in a barter or a monetary economy. Monetary coordination failures play no role in this sort of "recession". But would we call that a "recession"? Well, it doesn't look like a normal recession, because there is an excess demand for bananas. Or, to say the same thing another way: if we want to understand a decrease in output and employment caused by structural unemployment, monetary coordination failures don't matter, and we can ignore money. Everything else is a monetary coordination failure. Even if the original shock was not a monetary shock, that non-monetary shock can cause a recession because it causes a monetary coordination failure. P.S. I think this is all in Benassy, somewhere. P.P.S. If you said "this is all ISLM, only ISLM with and without barter", you would be basically right. I have (implicitly) assumed a stationary equilibrium, with prices fixed forever. But a bright young economist (not me) could do the intertemporal version. "They define recessions as a drop in production." I don't get your apparently very strong and long standing objection to this. That definition doesn't preclude an expected associated contraction in trading of existing assets. The definition doesn't have to specify all associated activity. Surely most economists must be quite aware of such an association. Or are you suggesting that the example of a contraction (of sufficient qualifying magnitude) in the trade of existing houses accompanied by an expansion of trade in newly produced houses should qualify as a recession (other things equal)? JKH: Not sure how best to explain this. I think it's less about *defining* and more about "seeing". I see recessions as a decline in trade, that may also be associated with a decline in production caused by that decline in trade. Others see recessions as a decline in production, that may also be associated with a decline in trade caused by that decline in production. Home production is also production. It increases in a recession, precisely because trade falls. This is the first thing I read this morning and I just hope the soccer game I am about to watch is half as good. I especially like "to say the same thing another way: if we want to understand a decrease in output and employment caused by structural unemployment, monetary coordination failures don't matter, and we can ignore money. Everything else is a monetary coordination failure." I have a question (that I hope I can articulate in a comprehensible way): In your model the supply of fruit is fixed. If you change that assumption to one where the future supply of fruit is based on people's expectations of what they will be able to trade then what changes ? I'm thinking of a situation where low expectations causes people both to produce less fruit and to reduce their demand for gold (since they also expect to trade less). This seems like it would qualify as a recession, even though demand for money has fallen. Wouldn't this type of recession still be addressed by increasing the money supply ? If the CB starts buying up fruit trees for new money then won't this increase trade (since people now have excess money relative to the current price level) even though the recession was not actually caused by a excess demand for money? I wrote something a few months back which I think has some relation to what you are saying here - http://monetaryreflections.blogspot.co.uk/2014/05/the-problem-with-monetary-exchange.html (not as detailed or as well thought out, of course). I was struck by your scenario 3, because I was under the impression that you did not think that a recession could be caused by an increase in demand for a store of value that was not the medium of exchange. In fact I thought this was one of the main points where we disagree. In this scenario, if a monetary authority was to attempt to deal with the recession by buying fruit trees for gold, how effective do you think that would be? Nick, great amateur-friendly post. Thanks. You've made it clear that money is (mostly) evil. 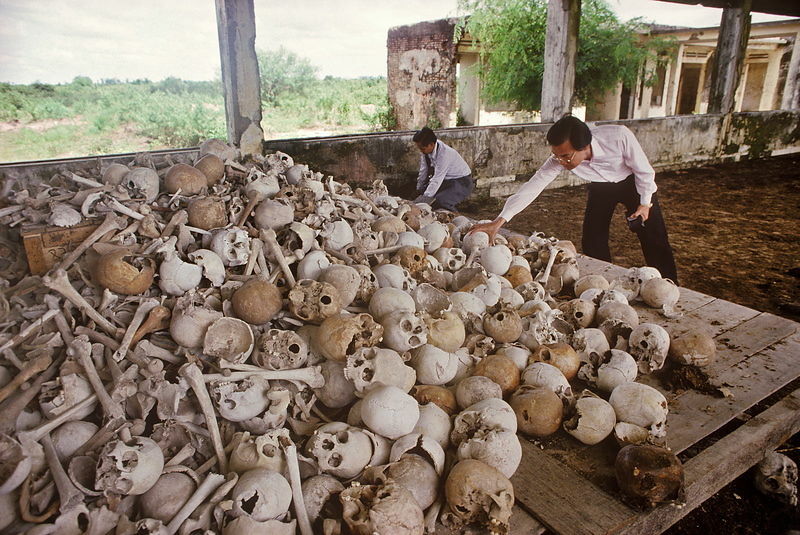 Democratic Kampuchea was basically on the right track. I think this is your clearest acknowledgement yet that when you refer to a barter economy you mean a magical, frictionless barter economy. You are wont to say that Keynes only makes sense if we think of his model as an essentially monetary model. Of course that's true if "monetary model" denotes one which isn't magically frictionless. But it's quite possible to get Keynesian results (and worse) from a model without money, as long as you don't introduce magic at the same time as you exclude money. The really essential thing, as David Glasner points out, is coordination failure. If the apple producers lose confidence in the banana producers and vice versa, both will cut down on planting. There's no point in growing extra apples for trade if the banana-growers are more interested in singing calypsos to each other. I take it that Tom Brown is making essentially the same point; Democratic Kampuchea tried barter but they screwed up the magic. I think there would be less scope for confusion if you used the Walrasian-versus-Keynesian distinction rather than barter-versus-monetary. "If you change that assumption to one where the future supply of fruit is based on people's expectations of what they will be able to trade then what changes ? I'm thinking of a situation where low expectations causes people both to produce less fruit and to reduce their demand for gold (since they also expect to trade less)." In the model as it stands, something very like that is already happening, in my first shock. The demand for money increases, the volume of trade falls, and that causes the quantity of money demanded to fall again, until the demand and supply of money are once again equal, at a lower volume of trade. Apple producers are consuming (say) only 40 bananas, and are indifferent between extra bananas and extra apples. Ditto, mutatis mutandis, for banana producers. But both would like to sell more of their own fruit and get more money in exchange, but can't. An increased supply of money would solve the problem. "I was struck by your scenario 3, because I was under the impression that you did not think that a recession could be caused by an increase in demand for a store of value that was not the medium of exchange. In fact I thought this was one of the main points where we disagree." I probably wasn't clear enough in the past. An increased demand for a store of value will not cause a recession, **unless it causes an excess demand for money as a by-product** (in this model it does). "In this scenario, if a monetary authority was to attempt to deal with the recession by buying fruit trees for gold, how effective do you think that would be?" I haven't done the math, but I'm pretty sure it would work. Helicopter money would definitely work. Tom: thanks! But I am surprised, because I thought this was one of my least amateur-friendly posts! Maybe it's because you are an engineer, and are comfortable with modelling. Kevin: yep. It is not money that is the root of all evil, but those frictions that require us to use money that are the route of all evil. Money partially overcomes those frictions. Money overcomes those frictions better when monetary policy is good. There are many different types of coordination failure. But those we call "recessions" have all the symptoms of a *monetary* coordination failure. Tom: I think this is the link you were looking for. ... Nick, yes that's the perfect accompanying up tempo "jingle!" I agree with Tom, very amateur friendly. (In France 'amateur' refers to someone who is very serious about their hobby and very good at it, just not quite at as good as a professional. Many of your readers are 'amateurs' - smart and well read, but not econ professors). This model cleared up something I've been thinking. Your writings on monetary policy solving recessions applies to demand recessions, not to supply recessions. In this post al three cases are a change in demand. If we had bad weather and the trees only produce 90 fruit, then we have a recession and money/coordination is irrelevant. The same would be true if some despot came through and cut off the lowest branch on each tree. The fascinating thing is that for ~20 years, all the US recessions have been demand recessions. I wonder if we are now in an age of abundance - no supply shock is strong enough to create a general recession. "An increased demand for a store of value will not cause a recession, **unless it causes an excess demand for money as a by-product**"
I think this is the same as what I mean when I say that: whether demand for non-money stores of value matters depends on the elasticities. A rise in the price of fruit trees might push demand towards gold or it might push it towards apples and bananas. The recessionary impact depends on which of those happens. For the same reason, I think that whether buying fruit trees for gold can combat a recession depends on the elasticities. But helicopter gold works for sure. As does helicopter trees. Squeeky: I get what you say about "amateur", but I'm still a bit puzzled about why this post is more accessible than I thought it would be. Oh well. There is a supply-side "recession" every single night (and every weekend) in Canada and the US! Because output drops. Because people don't like working at night, or can't see as well, so aren't as productive. Why don't we call them "recessions"? Because they don't look like the other recessions. No excess supplies. Nick E: an OMO is like a vacuum-cleaner of fruit trees + helicopter money. Is it possible, for *any* even vaguely reasonable elasticities, that a vacuum cleaner of $100 worth of fruit tress would cause the demand for money to increase by more than $100? Because if it causes the demand for money to increase by less than $100, the $100 helicopter money will create an excess supply of money (reduce the excess demand for money). So OMO would work. Could trees be more like money than money? > Tom: thanks! But I am surprised, because I thought this was one of my least amateur-friendly posts! Maybe it's because you are an engineer, and are comfortable with modelling. I also really like this post. It reaches a simple conclusion, but it does so in a way that brings the intuition and math together. Let's talk about the definition of "excess demand". It seems to me that "excess demand" is the condition where either of two-potential-actors-in-a-trade refuses to complete the potential trade. For example, in a potential gold/banana trade, the owner of gold prefers to keep his gold rather than trade it for a banana. The gold owner has an "excess demand" for gold. Now we assume that several Walrasian auctions are held with no change in pride of gold ownership. This could be considered as a sequence of recessions due to "excess demand" for gold. The price of bananas does not have an influence on this model of "excess demand" for gold because we have specified that only one owner, the gold owner, has decided that he does not want to trade. Now it seems to me like we can specify another model where the decisions of BOTH gold owner and banana owner are sensitive to price. If prices can change AND both owners are willing to trade, a price can be found that will complete the gold/banana trade. To conclude, "excess demand" seems to me to be a condition where ONE of the two traders is refusing to allow price adjustment to influence his trade decision. Yes, I think this can cause a recession. Fair point. I should have said something like "the extent to which" or "how easily" rather than "whether". Purchasing $100 worth of fruit trees might increase the demand for money by close to $100, but I agree that no "normal" elasticities would increase it by more than that. "Yet some depressions happen when savings vehicles are not at a discount but at a premium vis-a-vis cash. And other depressions happen when not all but only safe savings vehicles are at a premium vis-a-vis cash." This sounds a bit like your scenario 3. People increase their demand for fruit trees and the price of fruit trees rises. However this does not necessarily lead to a recession. The price of fruit trees says nothing about the demand to hold money. If the increased demand for fruit trees co-insides with an increased demand for money (either because of the interest rate effect that you describe or because the fruit tree trading that takes place leaves money in the hands of people who tend to spend less, or just because the demand for fruit trees and the demand for money is correlated) then this will cause a recession. Roger: what you are talking about is a "perfectly inelastic" (vertical) supply or demand curve. As long as EITHER the demand curve slopes down, OR the supply curve slopes up, we will (usually) get an equilibrium price where the quantity the buyer wants to buy equals the quantity the seller wants to sell, which means excess demand (or excess supply) is zero. UNLESS the price is fixed and cannot adjust (which is what I have assumed here). MF: Yes. I added my case 3 to handle that example of Brad's. If Nick R is so smart, maybe he can write some smart letters to Congress reminding them that Franklin Roosevelt solved this problem not by monetarist BS, but by the WPA. Chris: that's Brad DeLong's stylistic quirk! maynard: read about Roosevelt's "monetarist BS" policy of raising the dollar price of gold. IIRC, your semi-namesake approved too. The model in this post too is very much based on a line of literature that began as an interpretation of Keynes' insights. You should read that Maynard Keynes guy sometime. He's worth reading. Especially if you are going to name yourself after him. Mr. Rowe, I don't understand a few things. Quoted items below may be mild paraphrases for simplicity. (1) You specify: "G is the quantity of gold held, and P is a price index". So, I take G to be a quantity like ounces. Later, you specify "Agents get utility from the real stock of gold G/P they hold; they like to flaunt their wealth." What are the units of "G/P"? How does "the quantity of gold" differ from "the real stock" of gold? (2) You specify that in the monetary economy "agents hold a real stock of gold G/P because it makes shopping easier." Again, if G is ounces, what is G/P? It seems that everyone in the monetary economy is holding gold to trade for fruit, and they all consume the same amount of fruit, so their gold holdings would not change after they settle up each day. For them, jewelry is nothing and trade is everything, so their gold holdings are adequate and they don't care to hold more. It also seems that they don't care to hold less. (3) You specify an economic shock: "Demand for gold (g increases), holding prices fixed." You have lost me. Demand for something is expressed as a price, as a bid and asked. If prices remain unchanged, then what is a change in demand, speaking carefully as an economist? (4) You specify (claim) that there is recession in the monetary economy. Why? Everyone holds gold sufficient for trade both before and after the shock. The price of fruit will go down (eg apples per ounce of gold), or the equivalent statement that the price of gold will go up (eg. ounces of gold per apple). The value of gold held (in fruit) will go up. Even if some poor farmer held no gold on the fatefull day, there will be some price at which he can sell apples for gold, then trade that gold for bananas. So, there is no recession. If you merely specify that the trade in gold just stops, then of course no one can trade. But, gold is the money in this economy, and a mere change in price doesn't remove it as a medium of value for trade. How have I gone wrong? 1 and 2: Yes, G is measured in (say) ounces. "real" is just economists' jargon, that is perhaps misleading in this case. G/P means the value of the gold in my pocket, in terms of how many apples and bananas it will buy. If I could perfectly synchronise my shopping, so that I spent money the instant after I earned money, the average stock of money I would hold would approach zero. But it is very inconvenient to synchronise your shopping like that. 3. "Demand for something is expressed as a price, as a bid and asked." Not as that word is normally used in economics. "demand" is a *relationship* between price and the quantity you would want to buy at that price. An "increase in demand" means you want to buy a bigger quantity at any given price. In other words, "demand" means the whole demand *curve*. 4. See above on synchronisation. I normally like to keep around $100 in my pocket in cash on average over the week, because it makes my shopping easier. But I might change my mind and decide to hold $150 instead. Yes. If the price of fruit falls in terms of gold (if the price of gold rises in terms of fruit), then G/P will rise, and we won't get a recession. But experience shows that many prices are slow to adjust to demand and supply. I have assumed fixed prices here. @Nick Rowe -- Actually, my moniker is Maynard G. Krebs, the beatnik on the Doby Gillis TV show of the late 1950s played by Bob Denver, who later went on to fame as Gilligan, in Gilligan's Island. Perhaps it would have been more correct for me to say that it was FDR's fiscal policy (aided by WWII) that ended the Depression, not the demonetizing of gold, which took place in 1933, to no discernible benefit. Well, maybe going off the gold standard did pump up the stock market temporarily, much as today's monetary policy has done, also temporarily. This is going nowhere, and all the talk about monetary policy is keeping it that way, like it's really going to work. No. > You specify (claim) that there is recession in the monetary economy. Why? Everyone holds gold sufficient for trade both before and after the shock. Given the sticky prices, the evidence of recession here is that there are utility-improving trades that could be made (swapping apples for bananas) that are not made. Well-being is "left on the table," so to speak. This happens because by assumption all trade must go through gold as an intermediary, and every person willing to trade apples for bananas (at the given fixed prices) would rather trade apples/bananas for gold and stop there. From a game theory standpoint, we have a problem: any single agent can unilaterally improve their utility by exchanging surplus apples for gold and then reneging on the promise to use that gold to buy bananas. So the Nash equilibrium here is recession, where fruit doesn't trade for gold. Good stuff. But it's not a model which gets at the 1970s oil shocks. In order to get at that, I think you need to have a model which has a factor of production. Suppose trees need water in order to produce bananas. Start with a situation where everyone has enough water for their tree, supplied for free (simplifying assumptions...) and you get the model you have. "But I am surprised, because I thought this was one of my least amateur-friendly posts!" Actually, it's your most amateur-friendly post in a long time! (1) They usually know a lot of math, science, engineering, etc. (4) But they usually know very little jargon! You wrote: I see recessions as a decline in trade, that may also be associated with a decline in production caused by that decline in trade. Others see recessions as a decline in production, that may also be associated with a decline in trade caused by that decline in production." I have to say that you're wrong in this definition, and they're closer to right (though not right either). I'll show you why. In this situation, you can have a massive decline in trade with no impact on the real economy whatsoever -- no decline in production or consumption at all. I think perhaps it is best to look at the topic of interest -- recessions -- as a decline in *consumption*. We don't really care whether this is due to a decline in trade (stuff is produced but rots without being traded) or a decline in production (stuff is not produced) or *what*. What actually concerns us is the decline in the standard of living. > I think perhaps it is best to look at the topic of interest -- recessions -- as a decline in *consumption*. We don't really care whether this is due to a decline in trade (stuff is produced but rots without being traded) or a decline in production (stuff is not produced) or *what*. I think that's still a poor metaphor. The best definition is the one used implicitly in this post: a recession is a decline in *utility*. That can come through otherwise beneficial trades that are not made, or it can come through goods left un-produced. We can have situations were trades left un-made are not recessionary, as your alluded-to example of purely imaginary "transactions." We can also have cases where a decline in production is not recessionary, as Nick's example of people sleeping at night. The difficulty is that utility is not a measurable quantity, so in the real world we have to use production or trades as a shorthand. Nick's example in this post is a perfect case where production is exogenously fixed, so recessions happen in the trading aspect. Your above-posted example of a water shortage is a case where a recession would happen on the production end of things. The real world is even less nice than this in that time preferences and expectations make leading-order contributions to the economy, a problem thankfully avoided in Nick's "ABG" world. Stagflation can likely be summed as a combination of a supply-side, real-terms shock combined with too-loose monetary policy. This would happen in Nick's example if a blight wiped out half of the apples and bananas (equally), but left the gold preference unchanged. Relative to equilibrium, gold is desired too little. Now, in the barter economy we still have a recession; people consume an equal number of bananas and apples, but they consume less of each relative to normal times. In the monetary economy, we have a double helping of recession. People still consume less, but now fruit producers will be unwilling to sell their surplus for (now less-desired) gold at former prices. So net consumption is reduced *and* the distribution is suboptimal. If prices are flexible upwards, this excess demand will instead show up as inflation. (1) They usually know a lot of math, science, engineering, etc." I do sometimes tend to forget that. And that matters for a post like this, because STEM people are much more comfortable with abstract modelling, especially if you lay out your assumptions reasonably clearly. Economics is like STEM, in that way. But I'm not sure it's true of all my amateur readers. Majromax has given a good reply, though I'm not sure it would be exactly the same as mine. I could easily get a "recession" by just supposing that a disease, or drought, causes each tree to produce only 90 fruits. But with prices fixed, that would give me an excess *demand* for fruit in the fruit/gold markets. It would be easy to sell fruit, but hard to buy fruit. And what we call recessions are normally the exact opposite. It is harder than normal to sell labour and goods for money in a recession. And with prices flexible, prices would rise (like in 73), but again it would not be harder to sell fruit. I think that 1973 was a mixture of a shock like that plus a monetary coordination failure. The shock caused prices to rise, which reduced G/P because the central bank did not accommodate that increase in P.
I think there is one moment where Brad's critique is strong and that was not addressed by this post: sticky prices. It is your example in #2 (switch of demand, sticky prices) except that it may be possible that if there is a special form of price stickiness (eg. nominal downward) we may solve it by issuing more money so banana and apple prices both will have to increase to restore efficient equilibrium. As you say in conclusion "Monetary coordination failures play no role in this sort of "recession"". However from money as MoA there for sure is coordination failure - more sticky prices refused to adjust and monetary injection would solve this issue. I would say that this seems like recession to me. JV: I think you are right. I think that if prices were sticky down but flexible up, then that case (2a) would be partway between 1 and 2, in that the barter market could partially help (though I haven't checked the math), and an increase in G would restore full equilibrium. God! Maybe I should build more models! I agree with Majormax's criticism of my comment. I think we do have a terminology problem. I'm not sure it's useful to confine "recession" to strictly monetary phenomena, even if those are the most *common* recessions. The sort of economic problems where there are major shortages of goods on the shelves, though it's easy to sell 'em if you've got 'em, are perceived by the general population as "economic disaster". People will call them "recessions". If you say "that's not a recession", I think they'll just be rude to you and consider you out of touch. You need a technical term which doesn't have a common meaning. "General glut" (a very old term) will do nicely -- a general glut is always a monetary phenomenon. Other kinds of economic disaster, which people might call "recessions", or "depressions", are not general gluts.